Description: Fairly wide open with length and elevation. Blackberry bushes eat plastic. Local Directions: From Portland; 99W to downtown Newberg and a left on S. Blaine St. (RR tracks), to the course on your right at the end. 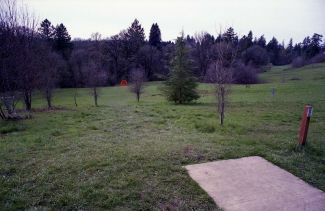 1st tee behind the house in front of the skate park.